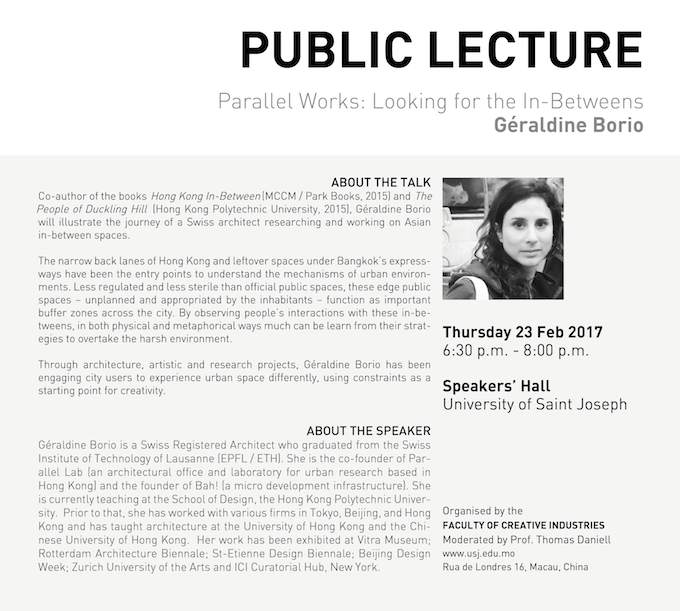 Co-author of the books Hong Kong In-Between (MCCM / Park Books, 2015) and The People of Duckling Hill (Hong Kong Polytechnic University, 2015), Géraldine Borio will illustrate the journey of a Swiss architect researching and working on Asian in-between spaces. The narrow back lanes of Hong Kong and leftover spaces under Bangkok’s expressways have been the entry points to understand the mechanisms of urban environments. Less regulated and less sterile than official public spaces, these edge public spaces – unplanned and appropriated by the inhabitants – function as important buffer zones across the city. By observing people’s interactions with these in-betweens, in both physical and metaphorical ways much can be learn from their strategies to overtake the harsh environment. Through architecture, artistic and research projects, Géraldine Borio has been engaging city users to experience urban space differently, using constraints as a starting point for creativity. Géraldine Borio is a Swiss Registered Architect who graduated from the Swiss Institute of Technology of Lausanne (EPFL / ETH). She is the co-founder of Parallel Lab (an architectural office and laboratory for urban research based in Hong Kong) and the founder of Bah! (a micro development infrastructure). She is currently teaching at the School of Design, the Hong Kong Polytechnic University. Prior to that, she has worked with various firms in Tokyo, Beijing, and Hong Kong and has taught architecture at the University of Hong Kong and the Chinese University of Hong Kong. Her work has been exhibited at Vitra Museum; Rotterdam Architecture Biennale; St-Etienne Design Biennale; Beijing Design Week; Zurich University of the Arts and ICI Curatorial Hub, New York.